External combustion - Internal cooling engine: To load repeatedly and exchanging heat to be effective unit. събота, 6 юни 2015 г. To load repeatedly and exchanging heat to be effective unit. If we resolve on working substance to expand (evaporates) without conducting enough work then to close the cycle we will need a large force to apply on it. At the same time there is no way to spread the load of single evaporator- turbine to decline in the course of work - to make the most of the opportunities of working substance. I therefore suggest that the same amount of working substance to perform multiple work as it passes from one evaporator to another with increasingly lower temperatures. In this way I can load the given amount of substance to work up and to take to cool and gaseous working substance due to heat exchange. A "cooler" loaded with a substance with a low boiling point(R41) at the end. 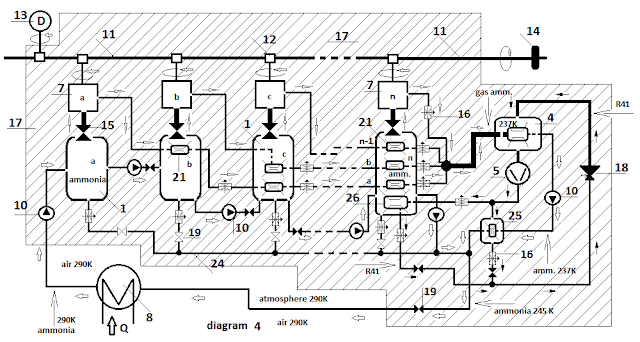 Its task is to cool the gas to liquefaction - Chart 4. 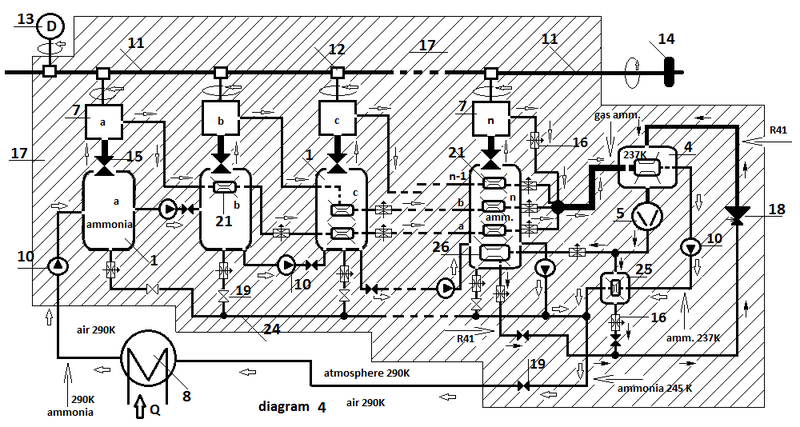 When proceeding to closing the cycle the gaseous working substance will have a temperature close to the boiling point and the power necessary for compressor 5 will be smaller than the power received from the plurality of converters of heat into mechanical energy 7. Such a unit will be effective. Публикувано от Svetozar the Cold в 23:49 ч.